1 - Four categories of tire tracks are from left to right : chain, belt, ring and tube type. 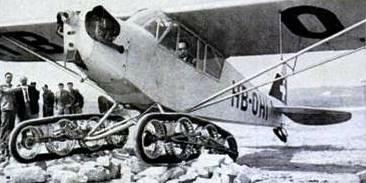 2 - Piper Aircraft equipped with tracked landing gear of G. Bonmartini. 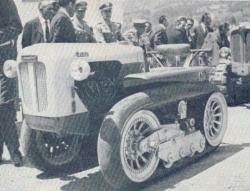 3 - Caterpillar 'Castoro' equipped with Bonmartini tubular caterpillars of G. Bonmartini in 1962. 5 - Side view of a patent of deformable multi-tires track of G. Bonmartini in 1964: each tire flange was articulated on the following. 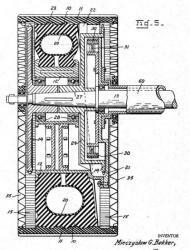 Patent. Drawing from review 'Ingénieurs de l'Automobile', 1966 05. 6 - Model of the pneumatic half-caterpillar H. Okada. The slip decreased from 37% with a wheel at 9.5% with half-caterpillar. 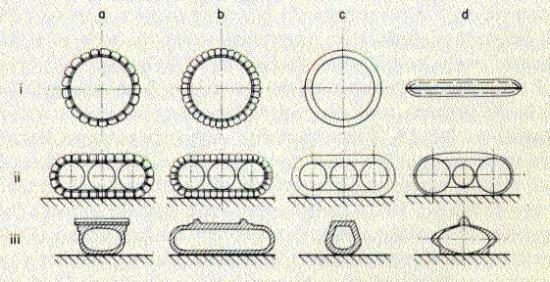 Pict from Journal of Terramechanics, 1966, Vol. 3, N° 1, Pergamon Press, Elsevier. 7 - Mobile Support of M. G. Bekker, side view. US2652290 patent. 8 - Mobile Support of M. G. Bekker sectional view. 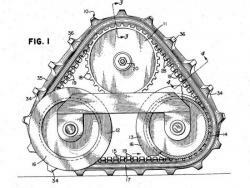 The mechanism should bathe in oil and the side seals should ensure waterproofness. US2652290 patent. 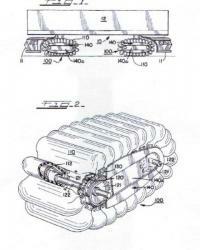 9 - D. O. Yoe proposed in 1963 a patent for triangular pneumatic caterpillar. Today this shape commonly exists on tracks. 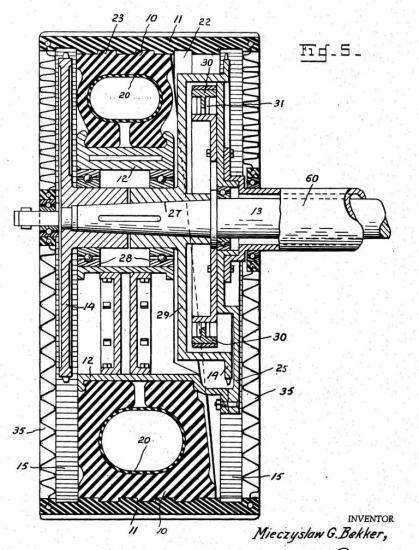 US3072443 patent. 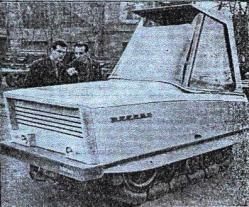 10 - The Scaled Test Bed, reduced prototype of the PATA, 1961. Pict J M M collection (from former Ling-Temco-Vought Inc.). 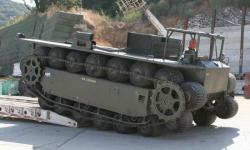 11 - It can be seen the different configurations of the caterpillar bags tested on the reduced scale model, the Scaled Test Bed. Pict from SAE paper 690152 : 'The Air-Cell Suspension System a Solution to Off-road Problems', 1969. 12 - The caterpillars of PATA (1965) occupied a respectable volume. The heat generated by the internal friction of the track warmed the cabin. Pict from review 'The Engineer', 1966 02 18. 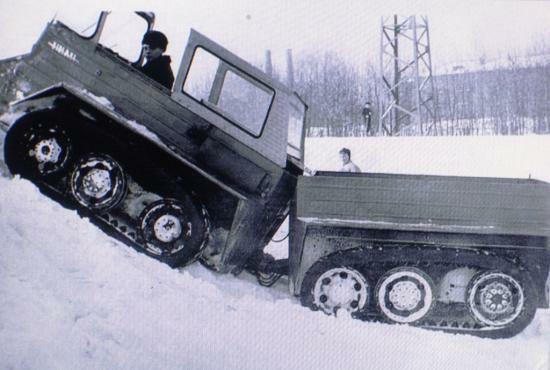 13 - Semi-tracked S-3M NAMI (1965) issued from a production vehicle encountered problems due to cooling transmission because the rear of the vehicle was heavier than the original wheels. Tracks brought a great smooth ride. Pict from book of Alain Dupouy, Auto-éditeur : 'Les véhicules tout-terrain N° 11 Tome I'. 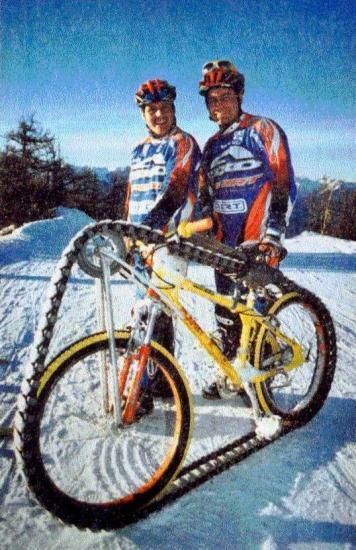 Grenoble, 1995. 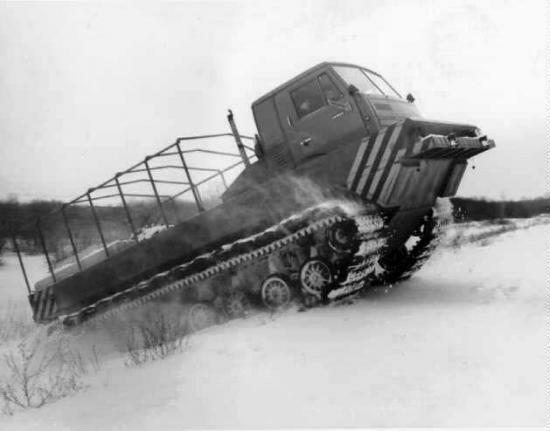 14 - The 0106 NAMI amphibious articulated tracked vehicle with tubular configuration tracks, which allowed good all-terrain performance, but the tracks logically proved insufficient for propulsion in water. Pict from http://www.off-road-drive.ru/archive/3/Prokol_spustila_gusenica. 15 - One of four moving treads of NAMI 0106. 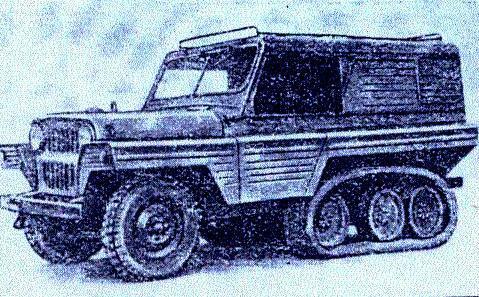 16 - UAZ-469 crawler 'Honeycomb' provided a better grip on the ground. 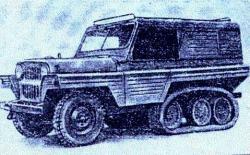 Pict from book of Alain Dupouy, Auto-éditeur : 'Les véhicules tout-terrain N° 11 Tome I'. 1995. 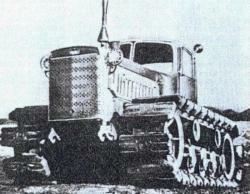 19 - The Evrika prototype tractor. 20 - T-54sPG tractor from Kishinev plant. Standard bands could be contiguous together to create tracks more or less wide. 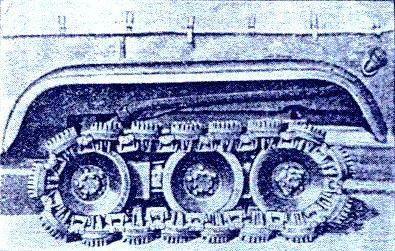 21 - T-150 Kharkov tractor has the same type of tracks that the T-54sPG. 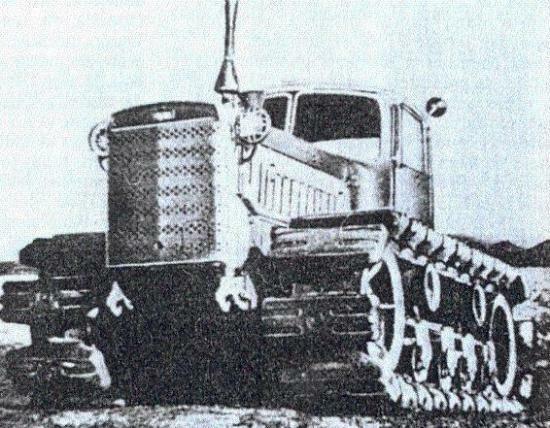 22 - DT-75 Kirovets tractor equipped with bags. 23 - Excavator E-4121 for emergency response in lackluster fields. Pict of the former site of www.nntu.sci-nnov.ru, of Nizhny Novgorod University. 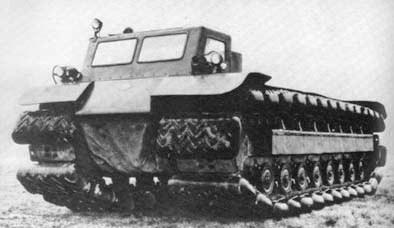 24 - STRPr6901-01, amphibious vehicle equipped with pneumatic studs. Pict of the former site of www.nntu.sci-nnov.ru, of Nizhny Novgorod University. 26 - Close up view of the Kristi KT-4 3/4 ton carrier, modified by Jered Industries, Birmingham, Michigan also called 'Water Walk' prototype. The Army constructed the floating bags. 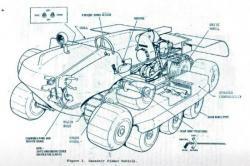 Picture below from the booklet RAVE I (Remote Area Vehicle Evaluation I at Pontiac, Michigan), US ATAC Research and Engineering Directorate, 29 Oct 1962. 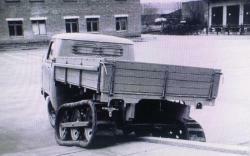 27 - The prototype Kristi KT-4 without its bags was designed to remain horizontal using levers and jacks. It is worth mentioning that all vehicles constructed by this brand were self-leveling through a patented mechanism on a slope smaller than 15 °. 180 units of this brand get out the assembly lines between 1953 and 1968. 29 - The prototype of air-cushion track of W. R. Bertelsen in 1987. The key to this track was slippery seal between fixed parts and moving parts. With a pressure of 0.5 kg/cm2, the problem seemed to have been resolved to travel off-road in mud, sand or rocks. 30 - Patent of air tracks with compartments W. R. Bertelsen 1985. It looked like the tracks of PATA. US4530545. 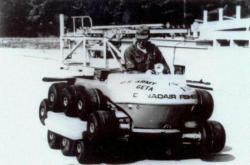 32 - Canadair-Fisher, a small high-performance ATV in 1963-1964, whose two copies were built. What did they become ? Collection J M Maclou (from Fred Crismon). 33 – Sectional view of Canadair Fisher : It can be seen well the wheels with tires causing a belt movement on which are fixed the axles of low pressure tires. 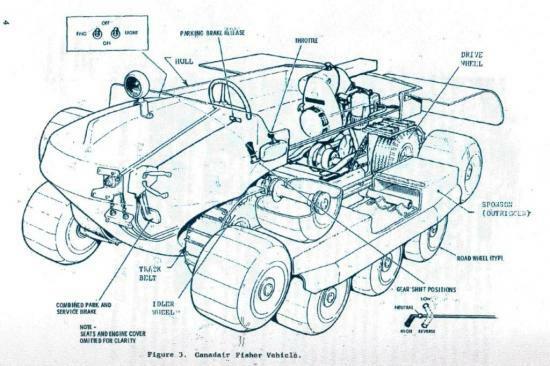 Drawing from 'Military Potential Test of Canadair Fisher Vehicle, NTIS, Dec 1967. 34 - Pneumatic caterpillar with rollers of W. W. Cushman of January 6, 1959. 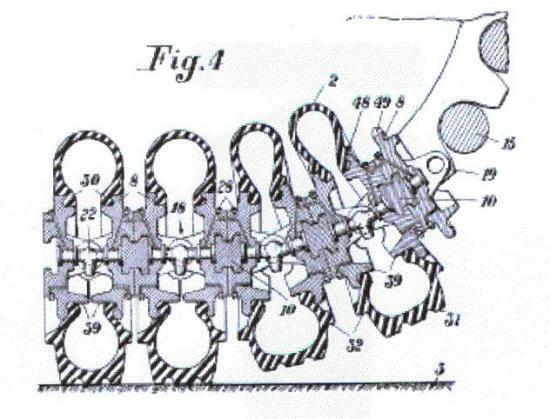 US2867480 patent. 35 - Tracked bicycle of Patrick Carn to move in snow or sand : it was surely better downhill. From 'Le Livre des Inventions', by Valérie-Anne Giscard d'Estaing, 1999. WSL, Whole Skin Locomotion robot, 2008, of Romela, University of Virginia, inspired by Amoeba locomotion where outer ectoplasm moves around endoplasm causing forward movement of the whole. It can squeeze through small spaces. Why not marry the advantages of wheel and track ? The pneumatic track is the answer : integrated suspension in the elastic element, higher speed than metal track, better load distribution. The first practical model comes from the Russian scientist N. S. Vetchinkin in 1927 and in the 30s, N. I. Gruzdev addressed the problem but abandoned for lack of natural rubber. Many patents can be found. There are four categories of pneumatic tracks (photo 1). From the standpoint of interest, only tracks of V. T. Sheppard in the U.S. and especially G. Bonmartini in Italy are of practical interest. 1 - A realization came from Count Giovanni Bonmartini, Aosta, Italy, who studied a landing gear for tracked amphibious light aircraft since 1930. In 1949, a 65 hp Piper was also equipped with a tire tracked landing gear (photo 2) studied in collaboration with Superga of Pirelli Group. The track consisted of an annular tube of sheets of gummed cord resting on two rods, all surrounding an air tube wrapped by a rubber surface. 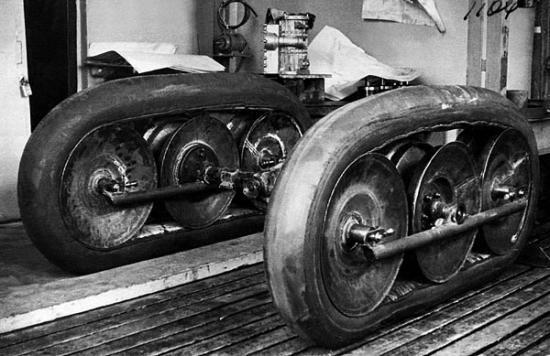 According to R. M. Ogorkiewicz (The Engineer's July 21, 1961), the aircraft landed normally in a field dotted with small cuts that would have proved disastrous with a classic wheel train. Bonmartini also adapted a tubular caterpillar to a 18 hp and 1.3 t Lombardini tractor, the 'Castoro' (photos 3 and 4) that demonstrated its ability to the First International Conference ISTVS (International Society for Terrain-Vehicle Systems) in Turin in 1962. A maximum speed doubled, caterpillars reliable and a few vulnerable, quickly changed if necessary and silent, that was what seduced. A small pump lubricated the inner surface of the caterpillars. 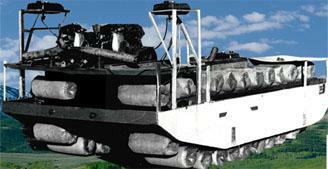 This pneumatic caterpillar tractor was sold commercially, but unfortunately they do not know the outcome of sales. Despite limitations in traction compared to a conventional track, the system had a real future in agriculture where the minimum land degradation is required. G. Bonmartini conceived also a multi-track tire (photo 5). 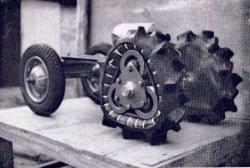 2 - A semi-pneumatic caterpillar (photo 6), whose model was built in 1965 on capital by Mr. Okada, Japan, presented itself as a kind of wheel with bearing surface increased ; the sides of the track were sealed using flexible diaphragms to prevent intrusions and keep lubricant required. 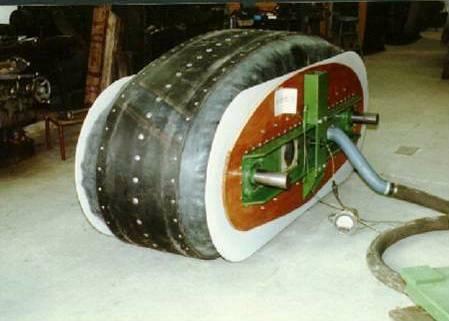 Increased tensile strength and decreased ground pressure was interest from a conventional wheel. 3 - Gregory Miezcyslaw Bekker, the father of the Theory of Off-Road Locomotion, filed various patents including a 'mobile support' (photos 7 and 8) in 1963. It was also a waterproof track and immersed in oil. An outer band driven slipped on a tire-shaped triangle whose section was narrower above than below. In fact it is always needed to increase the bottom because in the upper part are the brakes and transmission. There is no known prototypes. Similarly, D. O. Yoe proposed in 1963 a patent for a triangle shaped pneumatic track (Photo 9). In 1961 was built by Ling-Temco-Vought, Inc., Michigan of Chance Vought Corp., Dallas, Texas, a test model of scaled vehicle, the Scaled Test Bed (photo 10). The new idea was bags attached to a band and interconnected. Tested with different bag configurations (photo 11), this connection allowed a bag to absorb an obstacle by deflation, which transferred the air to the next bags. In fact, the model PATA (photo 12) (Plenum Amphibian Air or Pneumatic Tread All Terrain Amphibian) scale 1, which appeared in 1965 did not include this too complex provision. PATA had only two wheels and no track suspensions, the latter being carried by air bags that allowed to ride on roads and terrain to fairly high speeds (40 kph) and smooth It crossed the obstacles and slopes of 60%, a side slope of 30%, to roll in soft soil or deep mud and in water through its floatability (speed 10 km / h). It could carry a payload of 900 kg and its low center of gravity contributed to its stability. 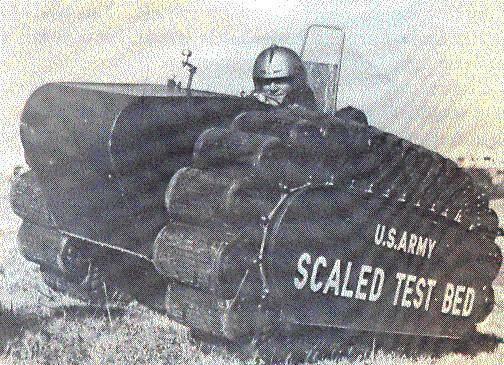 Testing at Fort Lee and Camp Wallace, Virginia, lasted from May 19, 1965 to May 13, 1966 for 41 days only of real test because of troubleshoots. The PATA behaved well as written above in the very muddy grounds but its maneuverability in other fields was limited. Many failures occurred in the track system with tearing of bags and overheating of caterpillars bothered the occupants of the cab. The lateral stability at high speed was poor both sides of the bags were flexible. We doubt that punctures occurred commonly but the companies involved reported that the PATA drive could roll with 5 deflated cells. The search lasted until 1969 with tire manufacturers with no other prototype. Pioneers in the research on caterpillars in general and pneumatic tracks in particular, the Russians continued their research at the NAMI Institute, Official Institute for Motor Vehicles in Russia, in collaboration with the Bauman Institute in Moscow (formerly Technical University of Moscow). 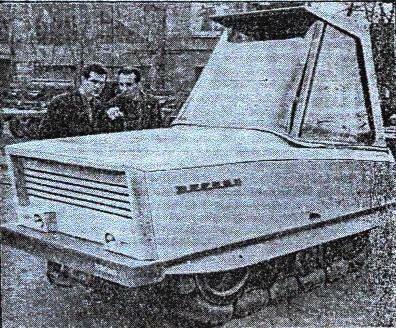 In 1961, they created a prototype called NAMI S-3 from a car series 4x4 Moskvitch transformed into a semi-tracked. The tests showed a silent operation for up to 40 km / h. Beyond, the elastic nature of the track caused vertical and lateral oscillations. 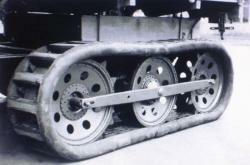 Subsequently in 1965, NAMI gave the name S-3M (photo 13) to its new improved prototype, semi-tracked with three rollers and a rocker, the tracks themselves were made of tire tubes reinforced of bars of steel. 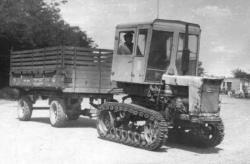 Then, again in 1965, NAMI built the NAMI-0106 (photos 14-15), articulated amphibious tracked vehicle with four pneumatic tubes. Its engine was an M-21 Volga, attached to a 4 speed UAZ-452 box and a main transmission of GAS-69, direction was hydraulic with a turning radius of 5,5 m outside. He climbed slopes of 25 °. The traction strength being lower than a conventional track, it has been tried a new track 'Honeycomb' containing empty enclosed spaces and mounted on a semi-tracked who became the UAZ-469 (photo 16). Traction progressed but the high price and lack of reliability did not justify the latter type of tracks. 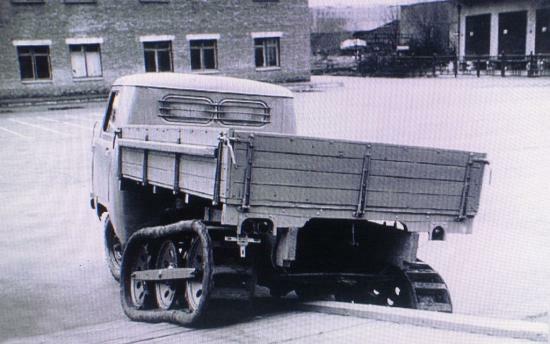 The semi-tracked NAMI S-4 (photo 17 and 18) with a new side strips tread and longitudinal tubes appeared, for stiffening and an improved handling. 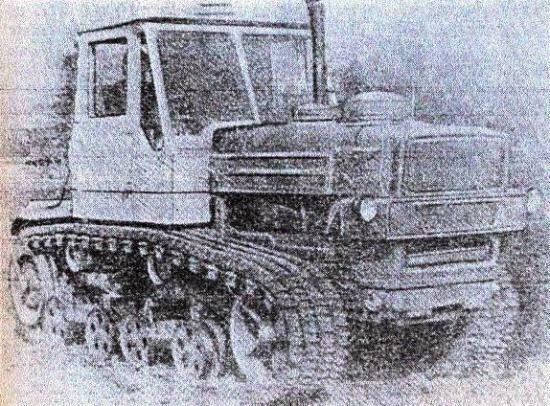 Returning to the mid-60s when a working group of the Byelorussian Institute of Mechanization headed by V. Roudelson in collaboration with the tractor factory Kharkov (KhTZ) and Krasnyi Rezinchtchick plant realized the experimental tractor 'Evrika' (photo 19) equipped with pneumatic tracks and based on the vineyard tractor V-101. 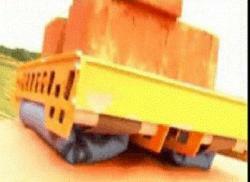 Its maximum speed was 25 km / h. The weight decreased by 15% but the grip also, what made it refuse to agricultural employment. It seemed then to be reserved for geologists and researches were abandoned. In 1970, the Gorky Polytechnic Institute was based at the University of Gorky that became again in 1991 University of Nizhny Novgorod. Renamed in 1978 ONIL VM (Research Laboratory, Division of All Terrain Vehicles), the Institute engaged in research on flexible air tracks. It realized a variety of vehicles such as the GAS-47PG, 71PG-GAS in the period 1976-78, the T-54sPG (photo 20) for Kishinev tractor factory and the T-150PG (photo 21) for the Kharkov tractor factory, Ukraine. 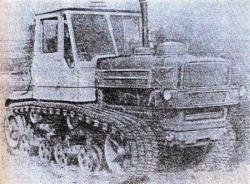 The Kirovets tractors DT-75, St Petersburg (photo 22) were studied for wetlands. 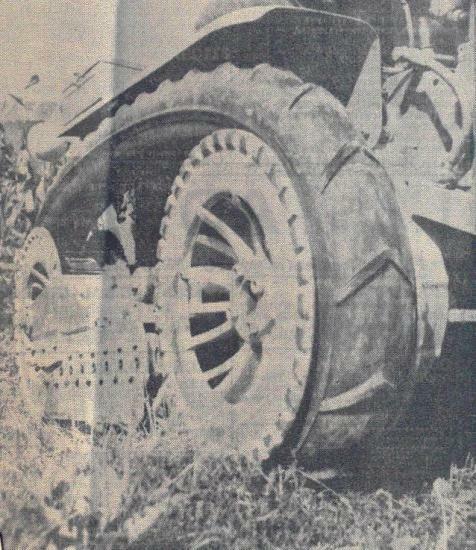 In 1980, it was concluded that the introduction of pneumatic tracks allowed lower compaction of the soil very favorable to agricultural machinery. In this area became famous names like Bocharov, Semenov, Veselov, Novikov. 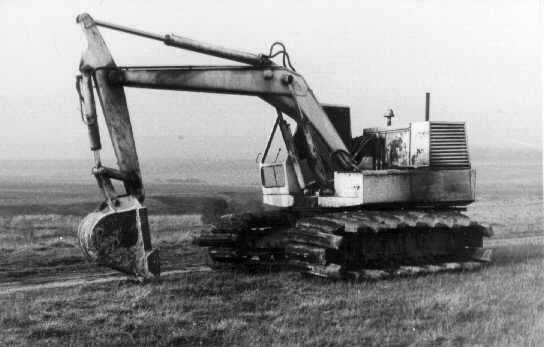 In 1985 were developed and series made excavators E-5015 and E-4121 (photo 23) with air tracks for the emergency repair of pipelines in the region of the Upper Volga. The same year came the amphibious vehicle STPr6901-01 (photo 24) 10 t payload on pneumatic tracks and components of KAMAZ trucks. 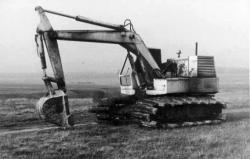 One of the models received in 1987 an excavator. The STPr6901 was series produced but the bars were they not in full rubber ? In forestry, the prototype of tractor LKhT-100 of the Onega Tractor plant led to a series of 200 pneumatic tracks environmentally compatible with the forest soil to Belotserkovskiy RTI plant. A private JST 'Transport TTM' currently distributes on the market the new products tested in the University of Nizhny Novgorod and in 1997 a major exhibition of new produced vehicles was held in this city with the participation of the greatest authorities of the time. 4.4 - The VACT of Asovtsev made around 2000, following the principle of a band equipped with air bags as PATA. Russian Researchers dreamed of universal amphibious carrier used for exploration in the inhospitable regions like the 'Far East' as well as Siberian regions of Australia, Asia, Africa or the extreme North and extreme South America. It should be used to explore the coast, coastal fisheries, the algae harvesting, or aviculture, the maintenance of drilling platforms, industries, forests or unloading of vessels remained off. Environmental concerns the land in addition to problems in rough seas of the vehicle, Azovtsev developed a prototype of amphibious transport vehicle with a capacity of 0.5 tones for a total mass of 1.25 t, the 0.5-VACT (photo 25) whose uniqueness lies in its air bag tracks with a smooth ride and combined with a good floatation. The hydraulic tests at the University of Moscow confirmed that the vehicle corresponded well to the initial project, and, not passing quickly, they could create a vehicle on that principle to carry useful 60 t.
It did not appear a prototype. We can finally report a theoric study of pneumatic track in agriculture by Ch. Zhdanovich of the Belarus State Polytechnic Academia published in a booklet SAE (Society of Automotive Engineers, Pennsylvania) in 1998 at the Off-Road International Transport Congress at Milwaukee, Wisconsin. Evidence that researches remain active ! The amphibious vehicle Kristi KT-4 (photos 26 and 27) known as Kristi 'Water Walker' in 1962 was surrounded by pneumatic bags (supplied by the Army) set on its tracks that allowed the hull to stay out of water. This original vehicle could remain horizontal on the slopes. Few details remain despite its evaluation during the exercise RAVE (Remote Area Vehicle Evaluation) by the U.S. Army. Similar studies in Japan during World War II had led to 'Vehicles to cross the marshes' (photo 28) but we do not know if the bags were inflatable. Dr. William R. Bertelsen, Rock Island, Illinois, built many air cushioned vehicles prototypes designated 'Aeromobile' in the 1950 to 1980. He was also involved in research on vertical flight, particularly by the diverted airflow from a propeller. 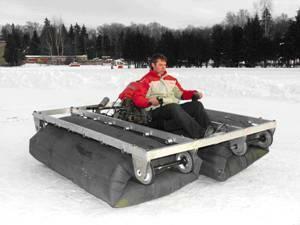 He also built many crawler prototypes devices with integrated air cushion for all-terrain vehicle (photo 29) of which can be noticed a presentation at the International Conference on Technology of Air Cushion in Toronto, Ontario in 1987. 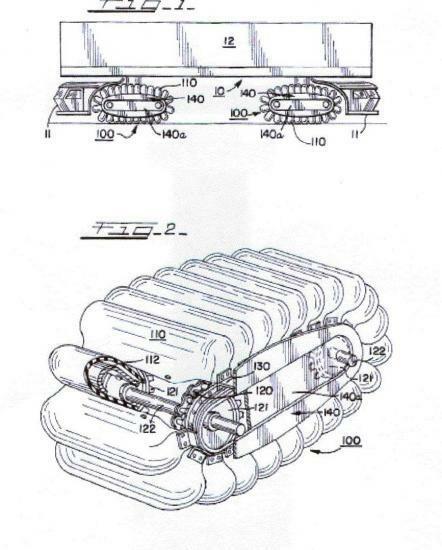 This patent from 1985 (photo 30) signed W. R. Bertelsen uses multiple pressurized bags around a caterpillar. Already covered in another chapter, Airoll (photo 31) seemed more like a series than the PATA. Similarly, the small ATV (All-Terrain Vehicle) Canadair Fisher (photos 32 and 33) in 1963-64 may well have also be manufactured in series after a few improvements. The recreational ATV, whose many manufacturers were making a variety of models, were selling very well in the 60s and 70s. 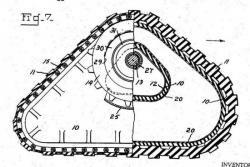 Tracks with pneumatic roller (Photo 34) were well represented in the patents. 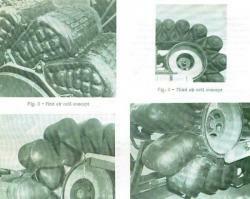 Inverted torus shaped bags have several applications including propulsion of vehicles (photos 36-37-38). As shown in the photos, the goal is to turn on itself envelope of the inverted toroidal bag, causing the displacement of the vehicle. The materials of the torus must be waterproof, strong and elastic and also fine and light. The torus are easily transportable and storable, lightweight, quiet, have a ground pressure very low (less than 0.1 kg/cm2), a good cushioning coupled with a large carrying capacity. The design of the suspension is very simple and they are many times less energy efficient than a wheel or a real track. Obviously, they adapt to any terrain. But nothing is said about their durability. We can see, a little before the middle of the video, a scale model of vehicle with inverted torus. The WSL, 'Whole Skin Locomotion' is cited here for reference to its similarity to the toroidal locomotion but the prototype is not equipped with pneumatic tracks. This system is analogous to the propulsion of amoebae which only the outer orbits the center and progresses. This new propulsion system for small robots terrain is tested by Dr. Denis Hong in Romela, 'Robotics and Mechanics Laboratory' at the Polytechnic University of Virginia, Blacksburg, Virginia.